Based on the principles of a Francis Turbine, the Kaplan Turbine was developed by the Austrian engineer Victor Kaplan towards the beginning of the 20th century. Due to its adjustable runner blades this turbine system is most adaptable to site conditions. The original original version with vertical shaft and inlet spiral case is commonly used and the the bulb turbine variant, which integrates generator in the casing, is used widely all over the world where the turbine and generator are fully submerged. 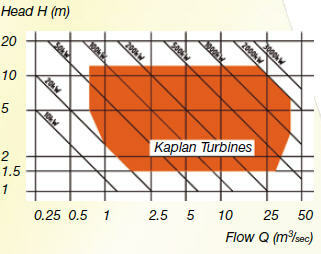 The Kaplan Turbine is of the reaction type where the runner is fully submerged and operates under pressure. At the inlet the velocity of the water steadily decreases, entering the guide vanes, passing through the runner and finally exiting the turbine after passing its energy to the generator. The water flow spirals in parallel down the turbine shaft and impinges on the fully admitted runner blades, where the flow is reduced further. The units are designed with specifically in order to prevent cavitation. Water flow is regulated by adjustable guide vanes. To achieve optimum efficiency at varying flows, the runner blades are automatically adjusted in relation to the wicket gate position. 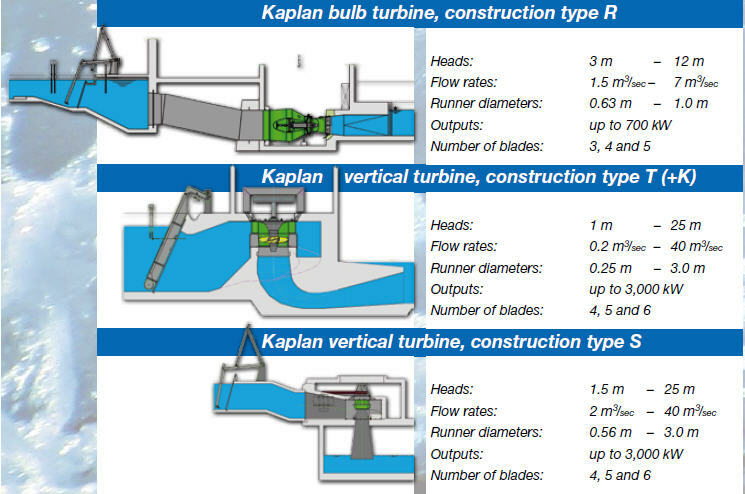 The Kaplan Turbine has an outstanding reputation for its high specific flow capacity. As a double-regulated turbine it is therefore most suitable for low heads and large flows, but also for variable head and flow conditions. It is ideally suited for sites with heads between 1.5 meters and 15 meters maximum. Your power station will be made to the OSSBERGER CONCEPT. Worldwide, more than 10,000 power stations have been tailor made using the Ossberger concept implementing the highest technical standards at a favorable cost and return on investment. During the project, a highly efficient project management team is provided to cooperate with and assist our customers. The quality-engineered turbine is manufactured by HSI and operates seamlessly with an Ossberger trash rack cleaner and Ossberger turbine controller which are both quality manufactured, reliable components which have a long and proven track record. All other components are products of from our preferred quality manufacturers. 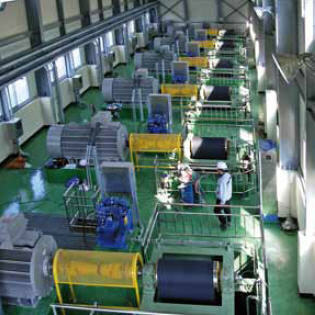 Ossberger have been serving hydropower customers for over 100 years and has successfully implemented mature and well-proven techniques that stand the test of time, using modern components to ensure that new units are always up to date with standards at that time. For all these reasons Ossberger are the technological leader in the field of small scale hydro power and have been for decades for the benefit of its customers. Ossberger are the technological leaders for quality hydraulic turbines, turbine regulation, control systems and for automatic trash rack cleaning equipment. Power station design and construction is always a fine balancing act: Individual units must be offered at favorable costs whilst maximising different potential forms of energy, and be a quality product that will stand the test of time thereby maximising return on investment. This balance has been perfected by Ossberger, by using standardized components. Available with three, four or five runner blades. Suitable for inclined or horizontal installation of the shaft. Speed transmission with flat high-capacity belt for outputs of up to 1,000 kW, and with parallel shaft gears for larger outputs. This machine is also available as construction type R for connection to a penstock and with belt drive connected sideways. This further development of construction type A is ideal for the use of a permanent-magnet-excited synchronous generator (PMG). The generator rotor is mounted onto the turbine shaft, therefore eliminating one set of bearings. Since the stator is located inside the turbine bulb and surrounded by water, optimum cooling is provided. These construction types incorporate a vertical shaft and are particularly suitable if existing civil structures must be considered. Intake and discharge do not necessarily need to be in line when looking at then plan view. 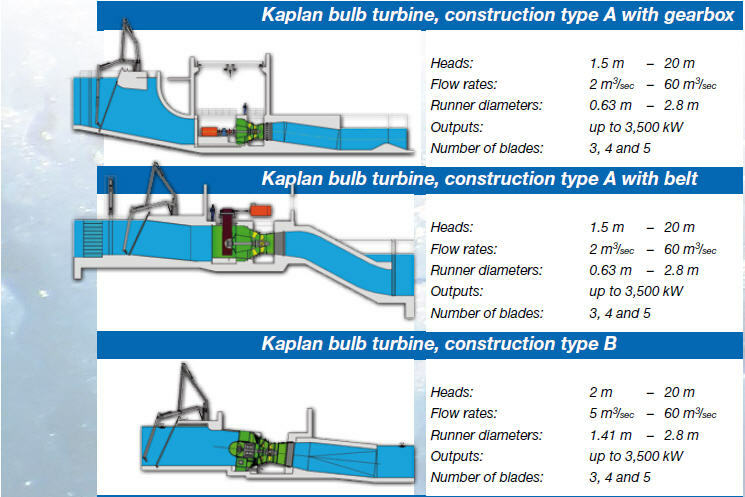 Turbines are available with three, four, five or six runner blades. Whereas inlet scroll cases of construction types K and T are made of concrete, construction type S is supplied with a scroll case in steel which reduces the risk of a clogged runner due to its spiral twist. If transportable by normal means, the unit arrives on site completely assembled. Installation can therefore be completed within a few days. A hollow shaft with internally sealed adjusting rod for the runner blade setting. Low-maintenance type, grease-lubricated with programmed automatic lubrication system. The multi-chamber type lip seal is connected to the automatic lubrication system. The seal does not require re-adjustment and is therefore maintenance free. The shaft protection sleeve is exchangeable and the seal faces are hard-chrome plated or coated with corrosion-proof hard ceramic materials to resist wear. The runner blades are made of aluminum-nickel bronze, which is highly resistant to wear and cavitation (EN-CC333G) or of chrome-nickel steel. The blades are uniformly set by the adjusting the rod and the lever mechanism, located inside the hub. The vane plates are double-sealed to protect against water leakage. 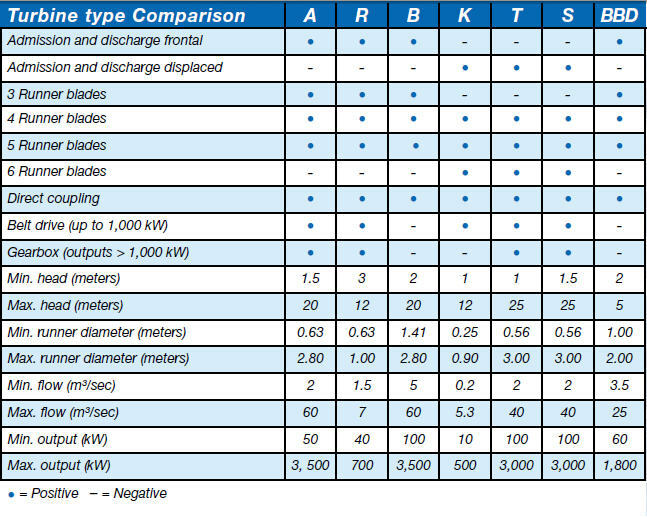 The number of runner blades and the material composition of the hub and vane head depend on individual customers requirements and utilization of the hydro plant. The runner blade setting is accomplished by means of a double acting hydraulic cylinder which is rotating with the turbine shaft. The hydraulic oil supply line for the cylinder is equipped with a special rotary adapter device. Is hemi-spherical, a fabricated steel construction. 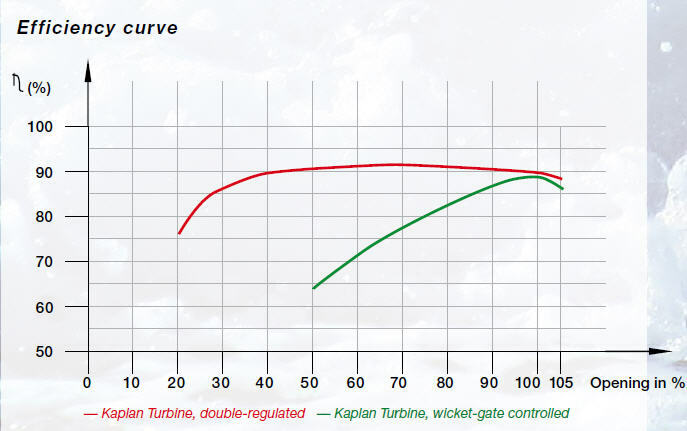 The wicket gate design depends on the turbine construction type. A detailed description will appear in your cost proposal. All turbine types offered include maintenance-free bushings for the wicket gate axles.